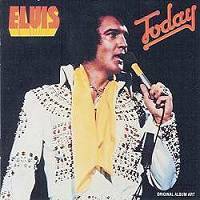 This is the announced Legacy edition of "Elvis Today". CD-1 contains the original album and all masters in undubbed and rough mix format. 'T-R-O-U-B-L-E' is listed twice, although this song was never overdubbed on the original release. CD-2 contains the previously released soundboard recording from Dallas, June 6 1975. Added are some tracks from other June shows the same year. Hopefully the sound quality will be just as good, or better than the bootleg release Dallas Seventyfive, which by good margin is the best of all releases of this show.